(Nanowerk Spotlight) The ability to generate functional nanoswitches might ultimately allow the integration of nanocomponents into electronic components. Single molecule switches using scanning tunneling microscope (STM) manipulation have been demonstrated before. Mostly these switches are based on single atoms or small molecules and operate between two distinct states. Researchers now realized the first multi-step switching process by STM manipulation on a single molecule. Instead of small organic molecules they used a large plant molecule which is environmentally friendly and abundant in nature. Dr. Saw-Wai Hla and graduate student Violeta Iancu from Ohio University have transformed a molecule of chlorophyll-a into a complex biological switch. Chlorophyll-a is a central molecule in photosynthesis – a process that converts sun light into chemical energy in plant leaves. The conformation changes of this molecule play a vital role in the photosynthesis process. The scientists used a scanning tunneling microscope to image chlorophyll-a and then injected it with a single electron to manipulate the molecule into four positions, ranging from straight to curved, at varying speeds (view a movie here). Though the Ohio University team and others have created two-step molecule switches using scanning tunneling microscope manipulation in the past, the new experiment yields a more complex multi-step switch on the largest organic molecule to date. "In our experiments" Hla explains to Nanowerk "we not only were able to image different conformation, but also able to induce and even reversibly switch the conformations of this molecule. Our study provides the mechanical, structural information of this molecule at sub-molecular level. Furthermore, we were able to determine the energy barrier to switch the conformation on Au(111) surface experimentally." All these points are important for fundamental understanding of this molecule. However, what is most exciting about this research is that Hla and Iancu exploited the controlled changes of four molecular conformations to demonstrate a four-step single molecule switch with atomic scale precision. "We can also change the switching frequency by changing the tunneling current" says Hla. "Furthermore, we could also explain the underlying mechanism of this switching process as energized by a single tunneling electron energy transfer to the molecule. 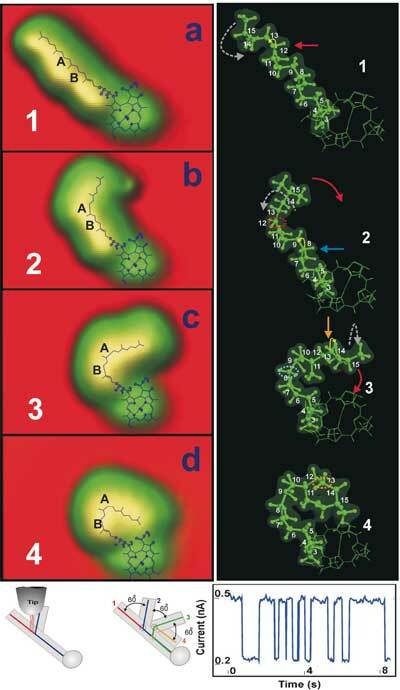 Experimentally, we managed to determine the energy barrier to switch the conformation of the molecule. This work opens an entirely new research route to study conformation of larger single biological molecules using STM manipulation with an atomic or sub-molecular control. Molecular conformations play a critical role in biological functions. Studying different molecular conformation and their mechanical, electronic and structural properties at an atomic scale will be extremely valuable for understanding and consequently, preventing diseases or tailoring of smart medicines. "For example" says Hla, "one could imagine using this plant molecule switch at a nano or atomic scale circuit junction to build a selector switch or to be used in a nano/atomic scale logic circuit. Other possible applications could be in bioelectronic and medical devices." An open access article describing these findings "Realization of a four-step molecular switch in scanning tunneling microscope manipulation of single chlorophyll-a molecules" appeared in the September 5, 2006 online edition of PNAS.